Is Chabad a Racist Criminal Terrorist Jewish Cult? Founded in 18th century Russia, Chabad is a branch of Hasidic Judaism, a form of Orthodox Judaism that promotes Jewish mysticism as the path to enlightenment. Chabad Lubavitchers study the Kabbalah [also spelled Cabala], the satanic creed that erases moral absolutes and believes God is 'subjective'. Chabad came to prominence under the guidance of 'The Great Rebbe' Menachem Mendel Schneerson [right]. His policies led Chabad through a period of great expansion establishing institutions in 900 cities around the world. 'The Great Rebbe' gave regular talks on the coming of the messiah. Over time, Lubavitchers began to realize that he meant himself. 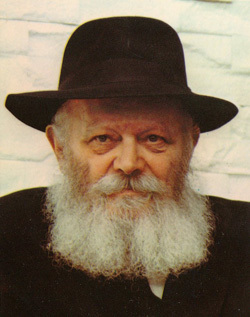 The belief that Schneerson was the Messiah was first openly professed by Rabbi Shavom Dol Wolpo in a 1984 book and quickly gained acceptance. Absurdly, even though he died in 1994 'The Great Rebbe' is still the official leader of Chabad, like 'Great Leader' Kim Il-Sung is the leader of North Korea. In Chabad school houses, children chant and salute the invisible Rebbe. 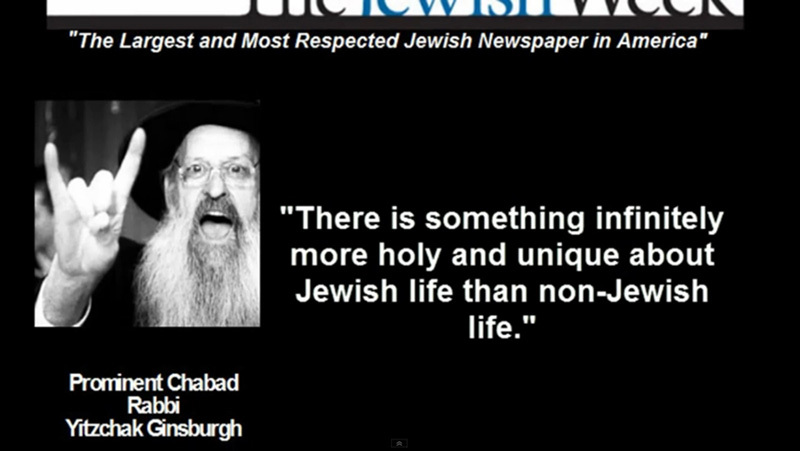 Chabad believes Jews are God's chosen people and everyone else is trash. In the book "Gatherings and Conversations" the Great Rebbe tells his followers that Jewish people are an extension of God and Gentiles are destined to serve the Jews. "Two contrary types of soul exist, a non-Jewish soul comes from three satanic spheres, while the Jewish soul stems from holiness." "A Jew was not created as a means for some [other] purpose; he himself is the purpose, since the substance of all [divine] emanations was created only to serve the Jews." "Gentile souls are of a completely different and inferior order. They are totally evil, with no redeeming qualities whatsoever." The Jewish Daily Forward reported a talk given by Chabad Rabbi Mani Friedman [right]. "The only way to fight a moral war is the Jewish way: Destroy their holy sites. Kill men, women and children (and cattle)." Chabad's extremism makes them perfect apologists for Israeli crimes. A perfect example is Alan Dershowitz [left], a Chabad member. Dershowitz is the premier Zionist apologist rolled out in front of the mainstream news cameras across the world to explain that Israelis are the victims of every massacre they carry out. 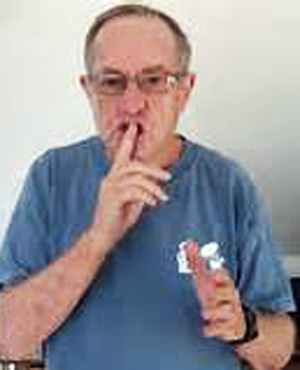 An unhinged and creepy individual, during a recent speech he gave at Oxford University he took off his glasses and told the students that he has "Zionist eyes" as do all "reasonable people", Dershowitz is one of many Jewish extremists in sheep's clothing who lead mainstream political discourse in the West. As further evidence that Wikileaks is an intelligence operation, Dershowitz recently joined Julian Assange's legal team. One of the policies of the Chabad is to send Rabbis across the world to set up Chabad houses. This movement, known as shilchus, has given Chabad a global support network. 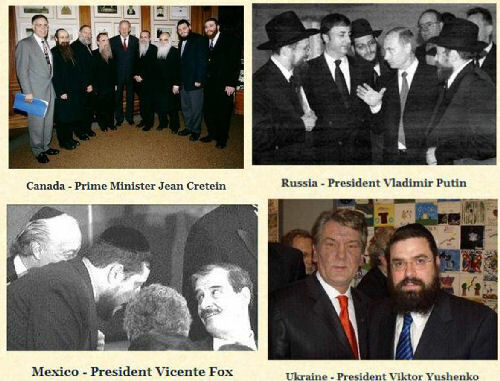 Lubavitchers mix with the upper echelons of each host country. Their influence in each country varies. The Canadian government recently gave the cult $800,000 for the building of a Chabad center in Montreal. Relations with Russia are less warm; the Russians recently refused to hand over two major collections of Chabad texts seized by early Soviet governments. Where is Chabad's influence the greatest? You guessed it - the US. Rabbi Shemtov is Chabad's Washington representative, and his enormous influence was illustrated when he lobbied successfully for the Great Rebbe to be posthumously awarded the congressional gold medal in 1995, the only religious leader ever to be given the award. Rabbi Shemtov is an all-pervasive presence in D.C. Sue Fishkoff, author of 'The Rebbe's Army: Inside the World of Chabad-Lubavitch', writes: "It's not enough that Chabad's man in D.C. knows the name and phone number of just about every congressman, senator and foreign ambassador in the nation's capital -- he also knows their legislative assistants, their secretaries and the people who clean their offices." Shemtov says that the vast network of shelichim inside the US generates his political power. "We have shelichimin forty-seven states and in [at least] 310 districts. ... People sometimes view the world of shelichim as three thousand people, but it's not only three thousand people, it's three thousand interconnected networks. So we can place a call from a constituent to almost any member of Congress." "Most shelichim have good connections with their senators, congressmen and governors, who represent the most remote places in the United States. For example, when Sarah Palin, a Republican, burst onto the scene, she had already known about Jewish issues and Chabad specifically from Rabbi Yosef Greenberg in Alaska." Members of the cast of 'Friends' recorded a piece for a Chabad telethon. Bob Dylan appeared on another. Chabad is a criminal organization with ties to Mossad. Chabad houses provides safe houses and storefronts for Israeli intelligence and criminal activity. This includes everything from terrorism to money laundering, drug running to prostitution. 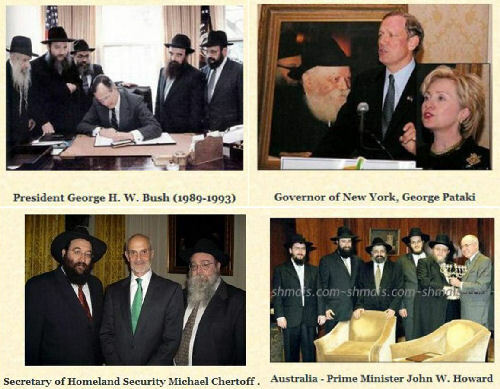 For instance, in March 1989 U.S. law enforcement rounded up a criminal network in Seattle, Los Angeles, New Jersey, Colombia, and Israel that involved a Chabad House that was involved in money laundering and currency violations. 'In Bangkok, Israeli military pilots and drivers who stay at the Chabad House there train Thai Army commandos, divers, and pilots who are fighting a Muslim secessionist movement along the southern border with Malaysia. 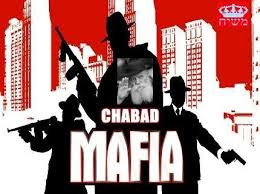 Retaliation against the Chabad mafia can be seen in the Mumbai terrorist attacks when Lashkar-e-Taiba militants took hostage of the Mumbai Chabad house and murdered nine Jews, including Rabbi Gavriel Holtzberg. Wayne Madsen has reported that mafia overlord Dawood Ibrahim ordered the attacks partly in response to Israeli mafia attempts to take over his Mumbai drug trade. 9-11... Who really did it?